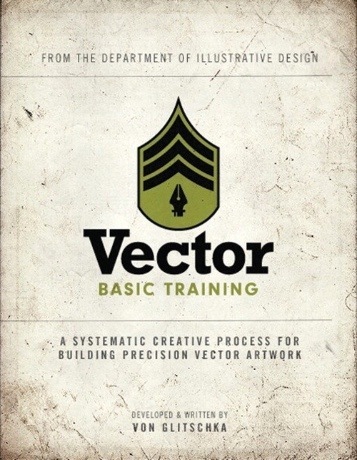 The last few days I've been perusing "Vector Basic Training: A Systematic Creative Process for Building Precision Vector Artwork" by Von Glitschka. Anyone who is serious about learning how to do vector illustration better in Adobe Illustrator needs this book. The core objective of the book is to help designers and illustrators build vector artwork more precisely and accurately. A secondary purpose is to encourage designers to draw, draw and draw. The book is filled with lots of examples of the author's work, with specific notes on the processes used to create them. Included is a DVD with four hours of screencasts as well as example source files. If you want to become a Jedi master of Bezier curves, get this book! As a digital Illustrator, I'm always looking for ways to make my Illustrations more realistic.. and the tricks and tips to make illustrating faster and easier. I rarely dive into the illustration world dealing mostly with logos and I'm shocked at how poorly executed some are - this will be a great read for our young designers.